Well, who says Friday Fun Day is just for my seventh period misfits? Today (Friday over here in the Far East) was a big day for old Whit and me. It was a good day at school, one with few breaks but lots of well-behaved kids for some reason. Maybe their parents had drugged them ahead of their planned vacations for the Chuseok holiday. But what made it a great day was that we just received our first paychecks. Well, actually they were direct deposited into our new Korean account. But we did see the amount we were paid when we went to the bank to pay our first set of bills (which, by the way, are about a fourth of the cost of American bills) and to withdraw some cash for a shopping spree tomorrow. I hate to boast. But really, by our standards, which are unfortunately pretty low, WE’RE RICH!!! Now don’t get any ideas. We’re not millioniares. Not even close. But if you did catch a flight over, we would take you out for a nice Korean dinner, maybe a drink or two, and some good fried Korean donuts! We got paid more than we ever have in any other job. Including my job as a reporter. Including Whit’s only “real” job as a job recruiter up in Washington D.C. So, what are we going to do with our newfound greens? For starters, we’re going out for sushi tonight. Enough of the Korean food for one night. In America, we always ate sushi to celebrate. So we’re keeping the tradition alive. And tomorrow, we’re going shopping! Going to the Korean bank was not an easy task. As you probably could have guessed, they didn’t speak English. And, well, Whit and I still haven’t done our homework for our second week of Korean classes, which doesn’t bode well for us. It took us a month to even learn how to say “Thank you” properly. The sounds they make with their mouths just don’t match many of our sounds. It really makes it quite difficult. 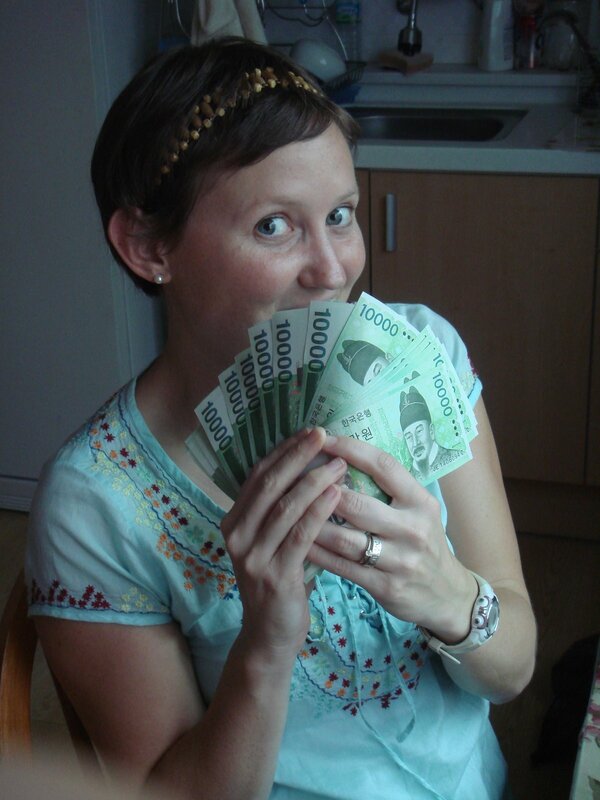 But through a lot of hand motions, and one mistake where Whit almost had the woman withdrawing every last penny of the account–which we didn’t catch until she was counting out millions of Korean won–we finally figured out how to pay our bills and withdraw a little bit. We don’t know how to apologize for our ineptitude, so I have taken to bowing. It seems to work. That and a few proper thank-yous and we are finally in black. And if that’s not enough reason to celebrate, we also have just made it through our first month of teaching in a foreign country! And on top of that, we’re on holiday for the next five days. And now that we have money, we’re planning a quick trip to the nearby beach over our holiday….that is, if we can figure out how to say “I want a bus ticket to the beach” in Korean. Next Post Blue jeans please, supersized. Good news! You guys are even richer than you think – the Won has appreciated 2% to the U.S. Dollar since you have been over there. Annualized – that’s a pretty good raise! It’s payday over here, too. We’ll pour one out for our homies over in Korea. That was supposed to be from the both of us. My bad. I know my husband is a dork. You thought it…I wrote it.